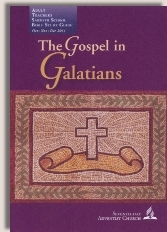 In the book of Galatians the question is asked about Grace: is Grace enough all by itself—is there any place for the works of the flesh in the salvation of the new believer. The answer over and over and over again is yes—grace is enough—nothing needs to be added to what Christ did on the cross. Christ's work is a finished work and He did it all. All we did is surrender into His amazing grace. Paul said (to paraphrase) that “all the works I did in my life before Christ I count as dung and refuse.” That's because they were done to gain the grace of God. They were done to add or help in his salvation. Paul was a first class legalist who was radically transformed into a new creation on his way to Damascus. He became a Christian from blindness that was not just physical but spiritual into true sight—again not just spiritual but physical. The rule Paul is referring to is this: Grace is enough. If people come in attempting to mix law and grace do NOT follow them! You were saved by grace through faith not the works of the law. And once you're truly born again—a new creation, a Christian—you die to the old law of sin and death and live unto the law of the Spirit, the law if you will of rebirth. What of the Mark? Is the mark of the Christian physical or something spiritual? I believe that we might very well be physically marked for our Christian faith—people are being physically and even mentally scarred for their beliefs. However I don't think Paul is speaking of something physical. The mark of the Christian is spiritual but results in changes that ripple into every facet of the life of the believer is the fruit of the Spirit that comes through being born again and being filled by the Holy Spirit. It is possible to be really nice without being reborn. Iit is possible to seem really religious without being reborn, it is possible to seem to posses the fruits of the Spirit without being reborn. However, resting in the land of possibility won't save you, and it won't transform you into a new creation. Only by entering God's rest will you be given the gift of God the Holy Spirit who by living in you will mark you as being a new creation. And out of that "marking" will result in something that cannot be denied, replicated, duplicated or pretended. God's Love will rule in your heart, and you will be able to love people the way God loves people. This is not a fickle love or a love with any kind of strings attached. This is an unnatural, supernatural love that only God can give through us to others. This is the love that led us to surrender our way into God's rest in the first place. It is the love that He had for Adam and Eve, for Abraham and Sarah, for Jacob, for Joseph, for Moses, for the Children of Israel, and it's a love unlike human love. God is love, and once we are new creations, we are His love too. One final point. In the last lesson I talked a little about Paul's works before he was born again. These works to try and prove himself to God as being worthy of earning salvation were dung, refuse, and not impressive at all. The new Believer, on the other hand, does the works that were prepared for Him to do by God since before time began. These works come out of a changed heart, soul and mind— from being a new creation. They are not done to help in salvation, they are a praise offering because of assured salvation! Boasting about the cross is not about stagnation, it's about Salvation. Christianity is not about being in a comfortable place, it's about moving on and being transformed. It's about following the Good Shepherd wherever He leads you. It's about grace alone, faith alone, Christ alone. It's about leaving old covenant curses for new covenant blessings. It's about the freedom to be a child of God.